Definition at line 3027 of file DeclCXX.h. Definition at line 3074 of file DeclCXX.h. Definition at line 3073 of file DeclCXX.h. Definition at line 3129 of file DeclCXX.h. Definition at line 3130 of file DeclCXX.h. Definition at line 2654 of file DeclCXX.cpp. Referenced by clang::Sema::ActOnNamespaceAliasDef(), and getPreviousDeclForInstantiation(). Definition at line 2669 of file DeclCXX.cpp. 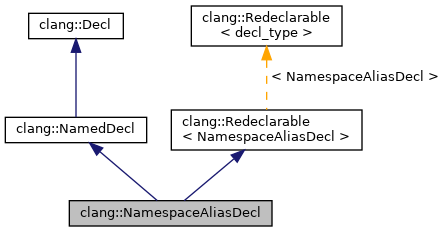 Retrieve the namespace that this alias refers to, which may either be a NamespaceDecl or a NamespaceAliasDecl. Definition at line 3123 of file DeclCXX.h. Referenced by clang::CodeGen::CGDebugInfo::EmitNamespaceAlias(), and clang::TextNodeDumper::VisitNamespaceAliasDecl(). Returns the location of the alias name, i.e. 'foo' in "namespace foo = ns::bar;". Definition at line 3113 of file DeclCXX.h. Definition at line 3082 of file DeclCXX.h. Definition at line 3085 of file DeclCXX.h. Retrieve the namespace declaration aliased by this directive. Definition at line 3100 of file DeclCXX.h. Referenced by clang::Sema::computeDeclContext(), clang::ASTContext::getCanonicalNestedNameSpecifier(), clang::TypeName::getFullyQualifiedNestedNameSpecifier(), getPreviousDeclForInstantiation(), and clang::ASTDeclWriter::VisitNamespaceAliasDecl(). Definition at line 3107 of file DeclCXX.h. Definition at line 3116 of file DeclCXX.h. Referenced by getPreviousDeclForInstantiation(), and clang::ASTDeclWriter::VisitNamespaceAliasDecl(). Definition at line 3095 of file DeclCXX.h. Definition at line 3091 of file DeclCXX.h. Definition at line 3125 of file DeclCXX.h. Definition at line 3119 of file DeclCXX.h. Definition at line 3029 of file DeclCXX.h.